I am still waiting for faith healing and the power of prayer to restore amputated limbs, reckon I’ll keep on waiting too. A plane with 300 on board crashes – before which, all the passengers prayed fervently to their deities (recorded evidence). There is only one survivor. Observation: the survivor experienced a miracle, and the rest must have “sinned” somehow. Now, what if the lone survivor was a scum-of-the-earth, convicted murderer, Hannibal Lecter type? There will “explanations” by believers, but I cannot conceive of them spouting them with a straight face. I think your cartoons are gentle. There’s absolutely nothing nasty (or even harsh) about them. Wonderful work. Franklin, I cant help but be pedantic. Theology is the study of the concept of Gods and religion. So theologists don’t necessarily pray to anyone. Assuming you mean religions, I don’t follow what makes the Abrahamic religions the main three? Islam and Christianity certainly come in on top if you are judging by the number of followers, but Hinduism comes in third with 1.1 billion vs Judaism’s 14 million. However, your point about them praying to the same invisible wizard does stand up. There are far worse delusions ‘out there’ than the delusion of an all-loving deity inflicting crippling sickness on the creation he so loves. A very current one is being held to by many Western politicians: Islam is just a religion, and can safely be respected as such. Try putting such empty-suited numpties straight, as Robert Spencer, Geert Wilders, etc. have done, and see what happens to you next. This is a real keeper. One of the primary arguments in my novel is that one’s religious beliefs are most often what he was taught to believe from tothood. This is true for all religions, and every person of every religion believes his to be the sacred truth every bit as fervently as Christians believe theirs. One’s beliefs, then, are more a function of happenstance of birth rather than truth. The Christian god is a trinity, the Jewish and Islamic god is not. More trivially, the Islamic god is one who speaks through Mohammed, the Jewish and Christian god is not. These are clearly three different gods. The Koran also misunderstands then denies the Trinity. Can’t be talking about the Christian god, then. As for being ‘Abrahamic,’ turning up thousands of years late to the party, claiming retrospective dibs on long dead prophets and then plagiarising (badly) some half remembered myths doesn’t count. Mohammed was basically the L. Ron Hubbard of the 7th Century. Call it one of the main ‘Hubbardian’ religions, and I’ll agree. PS: Note the way Islam pulls the ladder up after itself. The law in Indonesia, Brunei, Saudi Arabia and Malaysia (and elsewhere) passed to prohibit the use of the word ‘Allah’ by non Muslims to refer to, ummmm, the Abrahamic God! They’re not allowing anyone to pull that trick on *their* followers, now, are they..? @IanB – You go ahead and keep waiting! Every type of miracle has occurred including the restoration of severed or missing limbs, as you say, when warranted. But you’re being foolish and don’t have eyes to see what is happening all around you. You’re the type of person that only sees what he wants to see and you’re absolutely convinced that your right. Silly man! 1) Find a group of sick people, say 100 of them, or even 1000. Nice big sample. 2) Divide it in half, and pray for only half of the people, without telling anyone which half they’re in. 3) Study 40 different indicators of health before and after the study period. 5) Report on the two that improved. There is some research that suggests that prayer, far from bring beneficial for the sick, is actually harmful! I gather that outcomes in those undergoing major cardiac surgery were worse among the group being prayed for than the controls. David Amies, prayer being detrimental would be every bit as miraculous as prayer being beneficial. Unless of course the time spent praying prevented some action that might have been helpful, like exercise or simple rest. Another good one, Author. I love your rapier punch lines. It’s always fascinating to see a group declare that a huge segment of the world are just deluded fools. I watched a documentary recently on the Westboro Baptist Church and their approximately 80 members, all of whom seem convinced that the entire rest of the world is going to Hell and only they will be saved. Such amazing arrogance. Deluded fools indeed. Self-limiting disease is such a friend to prayer and the dispensers of woo. Thanks for the focus point, FF: “all three major theologies pray to the same deity…” I’ve seen some great responses, but I can’t resist adding my two cents. Especially since I used to believe that. If, as is most likely, there is no Abrahamic god, then members of those three religions are all praying to nothing, talking to the wall, as it were. Since 0=0, you could say they are praying to the same thing, but that wouldn’t be accurate. You should say they are praying to the same nothing, and nothing does not equal a thing, much less a deity. What they are actually doing is talking to themselves, praying to their own mental constructs of “God.” There are probably as many varieties of those as their are believers. I guess on that basis, I wouldn’t say that any two people pray to the same god, unless they happen to have exactly the same god-concept by chance. The best they can hope for is similar gods. That’s why, when someone talks to you about “god,” you should ask for a definition. Darwin Harmless, I think the effect David Amies referred to was thought to be due to the fact that patients were worried they must be really sick, because they were getting prayed over. (in their presence or they knew about it somehow, no blind trial at all let alone double blind). So, nocebo effect. Apologies if this is a duplicate – I’m getting nothing show up. I am a late arrival to jesus and mo. It has been a revelation (can I use that word safely on this site?). 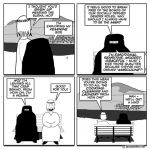 Do I sense some unresolved tension, frustration and critical feelings between jesus and mo in this and recent strips? Their pillow talk has seemed to me to be a fellowship of ‘us against the unwashed non-nonbelievers’ until recently. I’ll buy some books and check out my observation. Best wishes for your work. Fascinated by the thoughtful posts. Nice one Chiefy,But how would that work none of them do anything. If there were really only one god, we would only have one religion. @IanB – You go ahead and keep waiting! Every type of miracle has occurred including the restoration of severed or missing limbs, as you say, when warranted. Don’t happen to have before-and-after piccies of same, by any chance? Or are we talking salamanders? Mo is horizontal. It was a week of being horizontal that cured him. Whenever you have two monotheists whose beliefs about god are not identical, it is a matter of taste whether you say (1) that they believe in different gods, or (2) that they believe in the same god but disagree on the attributes of that god. Those two alternatives are equally apt descriptions of exactly the same state of affairs, notwithstanding their formal contrariness. I’ve long been intrigued by the idea that the Abrahamic religions are praying to the same god despite their differences. FWIW I think they are praying to quite different gods – looking at things from a social/anthropological perspective. But, viewed as a character passed on by tradition, you can see the link and understand its development over time and place, and see that they are in this sense ‘the same’. But not if the character actually exists. Then you presumably have to believe that different religions have all become aware of it (Him) by some mysterious means but nonetheless disagree significantly over what it says, wants, does, is like, etc. So if this god does exist, and if there is only one of it, the one thing that is certain is that it has serious communications issues. Alternatively, you could conclude that this, like most holy mysteries, is yet another reductio ad absurdam of theology and that there is in fact nothing there. Using unix / open source terminology, Islam and Christianity are forks of Judaism. Allah and God could be forks of jahweh. 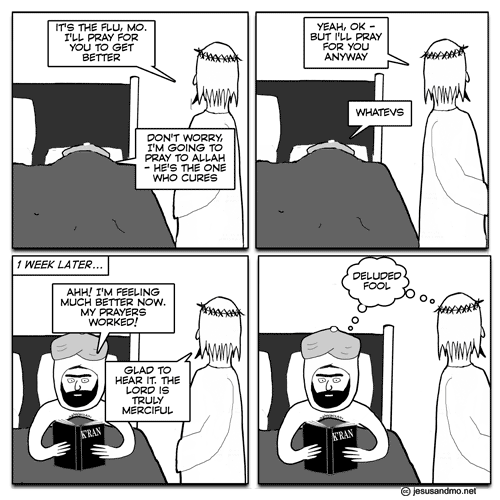 Since Jesus has a history of raising the dead, restoring sight to the blind etc, how come he has to go running to the old man in the ‘hit and miss’ prayer thing rather than just curing Mo himself? Want to know what is wrong with a religion, ask someone of a different Faith, and vice versa! It seems to me that being prayed for, when one is suffering a life threatening condition, could indeed be detrimental. The recipient of the prayers might well feel his/her recovery is being somehow externalised, and to a greater or lesser degree ease up on their personal fight with whatever is the threat. Somewhat reminiscent of how voodoo believers will crawl away and die just because they imagine a curse put upon them will be effective. Also I read somewhere that among certain peoples there is a tendency to accept that their life is over simply because of age, and individuals can easily persuade themselves to become moribund and expire. It would be nice to have the opposite possibility – to think and reason your way out of a deadly cancer, for example. It is the first time I saw the second one. Appearing on toast… hilarious. Now that’s brought a genuine smile, thank you. Hotrats, I had to share that second one on FB. Made me laugh. First one was pretty funny too. We can’t believe any image now. Regarding the one god worshipped by both question: As I understand it, Christians refer to God the father, and think of themselves as the children of God. Muslims consider themselves the servants of God. Big difference between being somebody’s son and being somebody’s servant. 😀 appearing on toast. Thank you for those! You put a prayer in one hand, and then you…..
NSPike, wildly OT but quite interesting. “The poor will be always among us,” was one of my mother’s favourites when explaining why being too profligate with charity was a bad idea. It’s very obvious that anybody claiming the bible is a moral guide has to climb up on a ladder and cherry pick like mad. “Put a wish in one hand and put *crap* in the other, come back in a day and what do you still have?”. DH: I think this one is ‘up your street’, so to speak. The author missed a trick here the barmaid should have delivered a course of antibiotics. JoJo, I agree with what you say, but I don’t think it specifically addresses what Brother Daniel said. If a god exists, it is what it is. What people have faith in are concepts of god only, especially since there is no real evidence to connect those concepts with reality. So the question is whether those concepts are similar enough to hypothetically refer to the same thing. It depends on how broad a definition of “god” you allow. It’s semantics. I can call a bat a bird, if I define birds as warm-blooded creatures that can fly. Similarly, if I define “god” as the creator of the universe, that leaves a lot of latitude. God could be the laws of physics, or primordial vacuum, or such. I. too, was musing on that same thing earlier. I do hope there’s nothing in any of his ‘limericks’ which Islamonutters might construe as blasphemy, insulting the prophet, apostasy, or any other very acceptable (to us) behaviour, and for which they might feel obliged by Allah to hunt him down. P2: They believe in different gods. But the next part of JoJo’s statement (“…as each is defined by its respective mythology”) is, I think, potentially misleading. For one thing, P1 and P2 are (explicitly) statements about the content of Bill’s and Ted’s beliefs. So it seems a tad bizarre to judge between P1 and P2 based on something exterior to those beliefs. And that’s what this appeal to mythology appears to do (unless I’ve misunderstood, which is possible). On the other hand, the beliefs of Bill and Ted are not sufficient to distinguish between P1 and P2. To see why, let’s introduce another character, Alice. Suppose Alice has the same beliefs that Bill has about god, AND the same understanding (right or wrong) that Bill has about the content of Ted’s beliefs. We could have Bill holding to P1 as the description of his difference with Ted, while Alice holds to P2 as the description of that same disagreement, with neither of them suffering from any contradiction in doing so! And that’s why I say that P1 and P2 are equally apt (in spite of being formally contrary). These identity-questions regarding god may appear, at first, to be no different from the similar questions that can arise regarding an ordinary person. Someone elsewhere might think “Brother Daniel is a pretty cool guy” while someone here might think “Brother Daniel is an idiot”. Having different opinions about Brother Daniel’s character and abilities, are those two people referring to the same Brother Daniel or to two different ones? But there’s no way to track god, even in principle. (I don’t even need to make any atheistic assumptions in order to say that.) So there’s no way to distinguish between the state of affairs described by P1 and that described by P2. QED. Or as we used to say, Amen. Prayer — with 2 aspirins — cures a headache. Sorry to come late to the party but I think the question of whether Allah and Yahweh are the same god or different gods is a nonsensical question. If you are speaking historically then they are obviously different forks/branches of the same earlier myths; if you are speaking religiously then you only have to read what the believers believe about them to see they cannot be the same entity – in one version the god has a son who is himself and dies etc. in the other version he doesn’t. If I came from another planet or a land which was very culturally distant from the judeo/christian/muslim cultures, I may not be able to see much difference and think they were all just slight variations/different denominations. In some respects there is probably more difference between the god of the catholics and the god of fundamentalist evangelicals and few people would say they do not believe in the same god. TL:DR The question as stated needs to specify from which ontological position one is looking for the answer before one can answer coherently. Adam Seligman, a professor of religion, has pointed out (in “Tolerance, Tradition and Modernity”) that the whole notion of religious tolerance assumes necessary differences, since there is no need to tolerate a religion that is essentially the same as your own. However, in another sense, all gods are the same god; they all fill the same hole in the believer’s head, and are indistiguishable from each other in the nullity of their evidence and plausibility. I got it. It was one my Grandad bought home from WWI (whilst leaving behind a substantial portion of his large intestine – and his belief in God). Nassar, Nassar, wherefore art thou, Nassar? Freethinkin+Franklin is right to say that this cartoon is somewhat misleading. Because I’ve always found J&M’s humour to be either in clever wordplay or of the “it’s funny because it’s true” variety, this one falls flat. Yes, Muslims and Christians have different beliefs about God. Muslims do not believe in the divinity or divine parentage of Jesus. However, at least from the Islamic persepective, the God about whom we disagree is the same. Verse 3:65 makes this fairly clear. Of course, I cannot speak for Christians’ view. We also share a belief in what I’ve heard described as a “personal God” who intervenes, who hears prayers and may answer. Since nothing that occurs in this cartoon’s narrative goes outside the shared beliefs, as I understand them, there is no reason for both of them to consider the other deluded in this context.